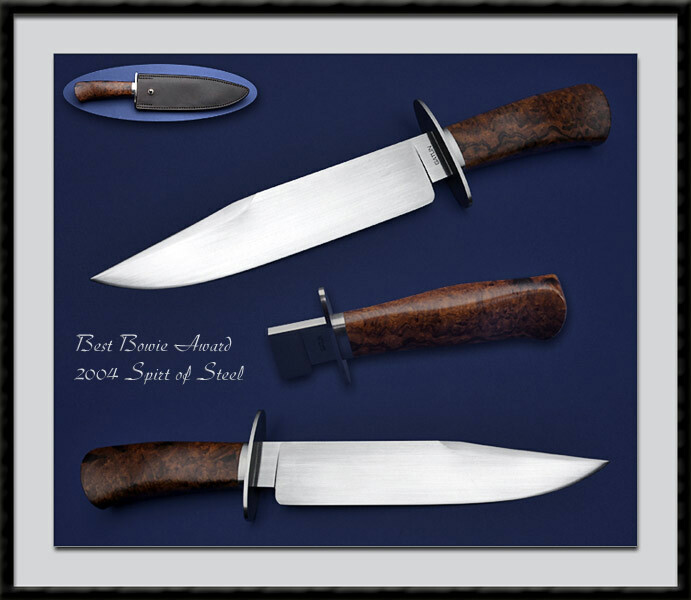 ABS Knife maker, Brett Gatlin crafted and won Best Bowie @ the Spirit of Steel 2004 with this Clip Point Bowie, BL = 9 1/8", OAL = 14 3/8", Hand forged from 1084 carbon steel, Hand rubbed Satin finish, Top clip is sharpened, SS Fittings, Presentation Ironwood Burl handle. Fit and Finish are of the Highest Order. Comes with the Custom Kenny Rowe leather sheath pictured. Condition is Pristine.